Day 4 – Milan Family – Horse Attack from the Back! I have to warn you about this next post. It is not uplifting or joyful. It’s actually a little sad, a descriptive tale of extreme horse drama and trauma here in the land where horsemanship was birthed. Pelion is a mountain region that is famous for indigenous Arravani gaited horses, and where Jason and Achilles were sent to learn horsemanship from the centaurs (mythological creatures, half man and half horse). 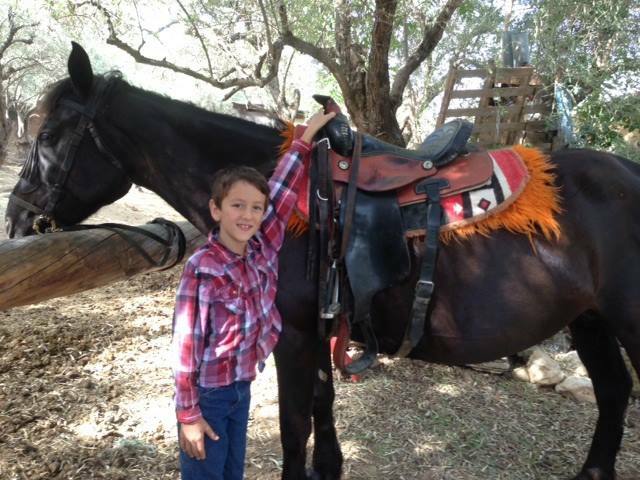 A Horse ranch advertised a wonderful trail ride in the mountains and along the beach. As we researched, we found the owner of the place was the president of the trail ride association of Greece. Riding on the beach with ancient native horses from the very land where natural horsemanship began, was a dream and deep desire of my heart. 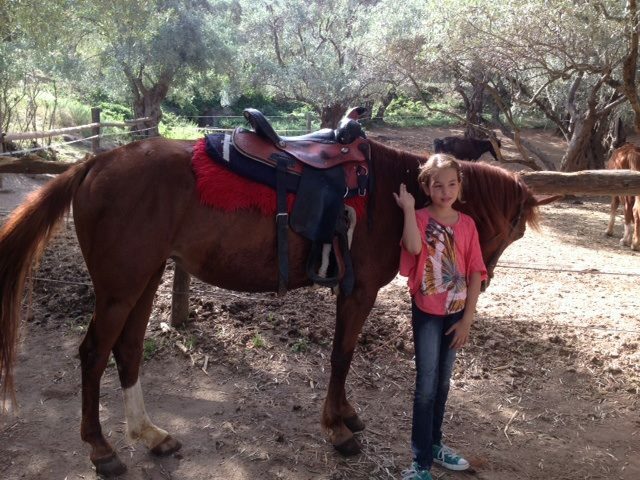 Today is also Dafni’s 12 birthday and she is an extreme horse lover, so we arranged for a 6-7 hour trail ride including a picnic lunch. We were VERY excited. As we drove to the horse ranch, we saw a wolf-like looking dog sneak across the road deviously looking in both directions. He had snuck into a neighbors farm and killed and stole a hen and was carrying it in his mouth. I pointed at him and said, “look! the thief!” We were all feeling sorry for the farmer who lost his hen. Little did we know this moment was a prophetic fore shadowing of the next several hours. We arrived at the horse ranch and the owner and a guide named Elena greeted us warmly. They had probably 30 to 40 horse there, mostly Greek breeds. There were a lot of stallions and babies and pregnant mares. After a while they told us which horses we would be riding. Dino and John got the two horses they described as peaceful and mild, which began to start some questions in my mind about the other horses. 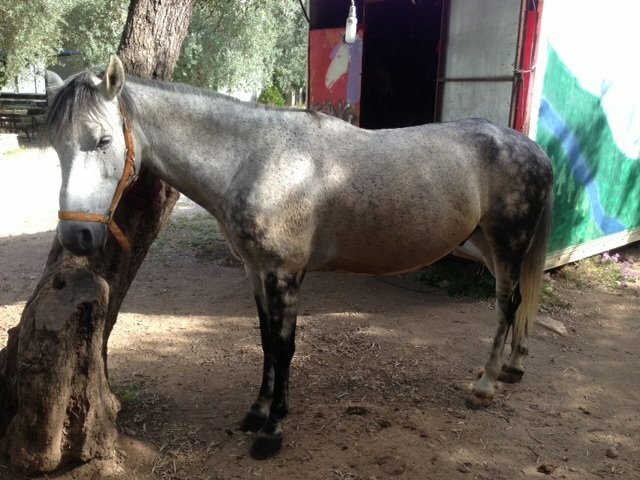 John’s horse was a grey Arravani named Vaiyo. Dino’s horse’s name was Beauty. Dalia got a Arravani Arabian mix named Koula, and Dafni got a Greek pinto named Billy. Dimitra’s horse was white and looked a lot like her horse Carmella back home. Her horse’s name was Jasmine. They told us that she had Parreli training and was an excellent endurance horse. It was Elena, the guide’s horse and she said she needed a light hand on her mouth. Perfect for Dimitra. They asked me if I wanted to ride a stallion. I thought they were kidding, but in case not, I said emphatically NO! I got Lico, another beautiful white horse the same Greek breed as Dimitras but cannot remember what that is. His name means ‘wolf’. AND wolf he WAS! All the horses behaved wonderfully tacking up and stood very calm for a long time. I talked with Elena about different kinds of horse training. She said she was a huge fan of Clinton Anderson and natural horsemanship. So I thought that we were all on the same page. I asked her if Lico had a soft mouth and she said, “NO, I needed to hold him”. She also said to not let him go in the front because he will run. Stupidly I figured that meant a Greek translation of ‘hurry’. So, they were actually serious about the stallion because Elena shows up to the group mounted on a black Arravani stallion ready to rumble! I questioned her about the safety with all these mares and she said, “no problem!” It started to feel like a perfect storm brewing. So right out of the ranch it started to not feel right. Elena darts off with my three girls and John and Lico is running after them, while Dino is left alone in the back, with his pregnant slow mare. So I catch up and tell them to wait. She asks why. I say, “because my son is left alone and his horse can’t see us and it’s not safe”. She sort of shrugs, like “crazy mother”. So John goes back for Dino and the owner John and Dino, bring up the rear. So everything is going ok for a while, except that John, Dino, and the owner are way back and all the girls with Elena are trotting fast and bumpy, and we are all trying to figure out how these rare Greek horses are gaited. Me and Dimitra are in Super English saddles. Mine doesn’t even have a dip to it. It’s like I’m sitting on a flat board that taunts me, “you can’t stay on here, you’re going off!”. I have tennis shoes on and large English stirrups and all I can think is, “Lord, don’t let my foot slip, don’t let my foot slip”. I am rehashing every grotesque story I have heard of people’s feet slipping through the stirrup and getting drug on the ground for miles until they have no face left. So we get close to the beach and I can start to see it through the trees, and my heart is pounding as I am nearly living out my dream. We approach the beach and we are all together and Lico’s hoofs just barely touch the sand and BOOM! off he goes like a bullet with me flying in and out of my 2 by 4 of a saddle. i am screaming at the top of my lungs! “STOP! WHOA! STOP IN THE NAME OF JESUS!” no stop, I tried Greek, “STAMATE” Still nothing. I am pulling the reins as hard as i can, I am jerking back the reins POP, POP, POP! still nothing. We are blazing at a dead run down the beach and now I know that all three of the girls are running right behind me, screaming and crying in hysterics. So I started to think straight for a minute. I told myself, “ok, Elli, just relax, sit this, and do a one rein stop” so I started yelling at the girls, “ONE REIN STOP!!! !” my horse was trying to turn left back onto a path towards the mountains, so I do a right one rein stop and this horse is pulling against my right rein with everything he had. UGH! That rotten Lico! So I am grabbing practically down to his bit and yank with all my might and fight this horse for what feels like an eternity and finally I get him to slam hard right into the sea. Meanwhile the girls have turned left and are headed for the ranch at a dead run. I had no control over this horse, so I couldn’t run after them. Then I looked over and see the most horrible and disturbing and frightful scene. Elena’s stallion is attacking Dalia and her horse in full blown frontal rear charge, the stallions front hooves even with Dalia’s head and baring his teeth in full aggression. I jump off of Lico, and try to grab the stallion, but Elena is now off of him trying to pull him off. The stallion has his front feet caught in Dalia’s reins and is now trying to mount her horse and still baring his teeth at Dalia who is only inches from his gaping mouth! I was hysterical, and totally helpless. Dalia is screaming and flinging her elbows at the stallion’s head and then covering her own head and then punching at the stallion. Her poor little horse equally trying to defend herself, kicking at the stallion and biting at him. Finally, Dalia’s horse Koula gets loose and runs down the road after the other two horses and Lico with no rider joins them. I look back and the owner is zoned out talking on his phone and doing nothing. Elena is yelling at him on the walkie talkie to come quickly. John and Dino have 2 pokey horses that even though John is kicking his horse desperately, his horse will only walk slowly down the beach. Elena still cannot get control of her horse and THANK GOD did not let go! Now the three girls have vanished from sight and I have no horse to go after them. Finally the owner gets his horse into a gallop and goes down the road to find them. In a few minutes I tell Elena to walkie talkie them and see if he found them. So she says, “he found them, they are ok, but Dimitra fell off”. So I get on the walkie talkie and Dalia is crying and yelling and trying to tell me what happened but saying Dimitra is ok. So after a long walk we get the girls who are quite shaken up. They tell us what happened to them. They were all running down the path towards the ranch. 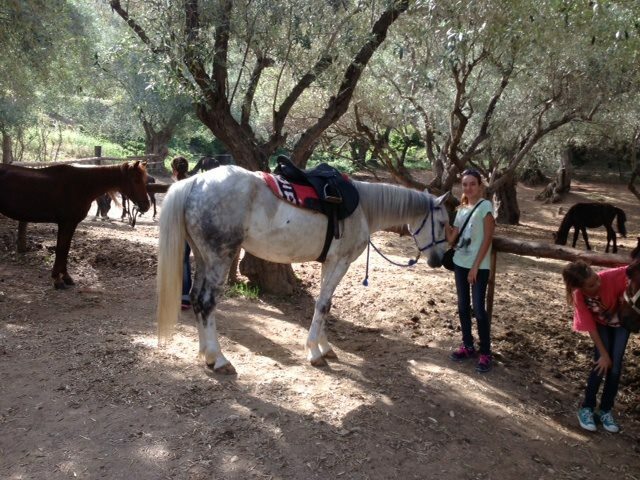 Dalia had lost her reins and was holding onto the saddle to stay on getting whipped in the face by olive branches as the horses started running through an olive grove. Dafni said, she was behind Dimitra and saw her roll right off and land in the dirt as her horse raced away. Dafni said she tried the one rein stop a billion times but her horse pulled the other direction and would not stop or even slow down. Dimitra said she was totally off balance in her english saddle and was praying and her foot slipped through the stirrup on the side she was going off. She said she was holding onto the horses neck and knew her foot was through the stirrup and she was falling off, but then all of a sudden she just remembers being on the ground looking up at a bunch of horse hoofs hoping they wouldn’t trample her. Meanwhile Dafni said she yelled out “Jesus! Help us!” and she and Dalia’s horse suddenly stopped and they jumped off, and then their horses ran off without them. All I can say, is the massive amount of desperate prayers going out from me, John and the girls brought all the angels to attention and miraculously no one was hurt. Even though Dimitra’s foot was stuck in the stirrup and she fell off a horse running at top speed, she only has one tiny bruise on her hip. Even though Dalia was attacked by a psychopathic highly testosteroned stallion fed on mountain herb, lost her reins, has only had 5 lessons, and her horse was running for her life, she stayed on until her horse miraculously halted briefly. And even though Dafni ran through a thick forest of olive trees at high speeds on Billy the wild, hard mouthed, Greek Pinto. No one is hurt! Thank you! Lord! I was so angry with the crazy people! Who would ride a stallion with children riding mares that is aggressive and so out of control? Why was the owner so lackadaisical? Didn’t he realize he was super stupid and had the lamest horses in the world that won’t even obey an emergency one rein stop!!! Here is the thing that totally astounds me. Knowing how to ride a horse and horses that willingly obey the rider because they respectfully look to the rider as their leader is the gospel of ancient Greek horsemanship. Greece had exported this concept all over the world. The Americans have resurrected this ancient way of natural horsemanship and marketed it and sold it to where it is the dominant way to ride in the united states. But now here, in 2013, in Greece, these horses, are ridden through coercive and abusive means to the point where a bit in their mount is useless and the very roots of this horsemanship are lost. As we drove away from there back to our beautiful apartment set along the calm peaceful seaside with the crystal clear blue water, I kept thinking of the wolf-like dog that stole the hen. I thought about how my horse that had started all the trauma was named Lico which means wolf. I felt like that limp hen his mouth was my beautiful daydream of riding ancient rare Greek horses along the very beaches where horsemanship began.